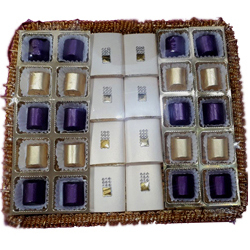 Convey your heartfelt wishes by gifting this Decorated Platter of 28 pcs. Handmade Chocolates to the person dearest to you. This Tray is loaded with 20 Pcs. Chocolate Rolls and 8 Pcs. Chocolate Slabs.